Adjusts from 24" to 36"
Save money on freight and pick these stands up at our Connecticut retail location! Also, Out of stock Brownell products are normally readily available within 2-3 days. 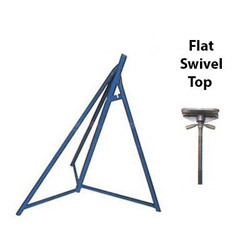 Brownell Sailboat Stands are available from 24" to 96" in height and are designed to be placed under the angled hulls of sailboats. Always use Keel Supports with boat Stands. When ready to use Brownell Boat Stands you must choose an area to store the boat that offers hard, stable ground to prevent the sinking of keel blocking and boat stands. Boat stands should be placed outboard on the hull for stability. The boat stand tops should have minimum thread exposed. Sailboats require a bow stand with a Vee top to prevent the bow from dropping forward. Using Safety Chains for Sailboat Stands: When using safety chain for sailboat stands, the port (or starboard whichever comes first) boat stand is placed in position with the boat stand top snug against the hull. A 3/16" chain is placed in the safety chain notch of this boat stand and the chain is passed athwartship either before, after or under the keel to the starboard, or opposite boat stand chain notch. The starboard boat stand is placed in its approximate position but not snugged tight against the hull at-first; the chain is pulled tight and placed in the starboard boat stand chain notch. Once snug in the chain notch, pull the starboard boat stand outboard until the chain is snug. Tighten the boat stand top, making sure the rear legs of both boat stands are parallel to the hull. Use safety chains and repeat this procedure for all side sailboat stands to prevent the boat stands from sliding up a boat's hull. * Keel Stands are a fast, labor saving alternative to wood blocks. They are much faster to install than moving several blocks into each position under the keel. Since they are adjustable, shims are no longer required. Brownell Keel Stands are made in America using 100% American steel. They are built to last many years and do not deteriorate like wood. Keel Stands: Brownell always recommend at least two keel stands placed on hard stable ground to carry the boat’s weight. Keel stands are quick to install and are adjustable utilizing the acme threaded rod, thus reducing labor and saving money. One keel stand is recommended for each 10,000 lbs./ 4,550kg of vessel weight. Keel stands are available in two sizes; K-3 (24"-30"/61cm-76cm) and K-4 (16"-24"/40cm-61cm). Our #KP-1 keel stand plate can be utilized under the keel stands to provide additional stability. Keel Bench: We always recommend a minimum of at least two keel benches placed on hard stable ground to carry the boat’s weight. Keel benches are quick to install and provide a wide surface area (24"/61cm) to support boat with larger and sometime hollow keels. We recommend one keel bench for each 20,000lbs/9,100kg of vessel weight. Keel benches are available in two heights BRB (28"/71cm) and BRB16 (16"/41cm). Our #KP-1 keel stand plate can be utilized under the keel stands to provide additional stability. Wood Blocking: We always recommend a minimum of two blocking piles placed on hard, stable ground to carry the boat's weight. Each blocking pile consists of four blocks, i.e. 2 base blocks facing fore and aft running parallel to each other, and two blocks placed across the two base blocks for the keel to rest on. This method has proven to reduce sinking of the blocks. For each blocking pile we suggest two of our B-8 (8"x8"x22"/20cmx20cmx56cm) pine blocks for the base blocks and two more B-8 pine blocks placed across the base blocks. Higher or lower blocking piles can be used depending on how the boat drains. Boat Stand Maintenance: Boat stands and blocks should be checked on a regular basis while your boat is being stored. Make sure the boat stands are snug against the hull and the keel blocks are supporting the keel and not sinking into the ground. Also check the blocks for rotting or splitting. Do not tie tarps to the boat stands. During windy conditions, check more frequently for proper boat shoring and security of our boat stands while they are stabilizing your boat. When not in use, we recommend lubricating the threaded rod section of our tops (WD40 or axle grease may be used). Our nestable and stackable boat stand bases should be kept painted with rust preventative paint. Replace any badly rusted boat stands or rotted blocks.